Cardiff City dented Leeds United's Championship promotion hopes with victory at Elland Road thanks to goals by Sean Morrison and Kenneth Zohore. After Greg Halford had failed to head in Craig Noone's first-half free-kick, Morrison converted a similar set-piece from Noone for the Bluebirds' opener. Zohore fired in a second following Aron Gunnarsson's break, to settle it. Fifth-placed Leeds failed to trouble keeper Allan McGregor, and had Liam Bridcutt sent off for two bookings. They remain fifth in the table, but are eight points behind second-placed Newcastle United before the Magpies' evening kick-off against Wolves. This England v Wales tussle, on the same day the two nations were to meet in rugby union's Six Nations, had plenty of subplots. Leeds boss Garry Monk, who tasted victory in the South Wales derby during his time in charge of Swansea, was up against Neil Warnock - one of Monk's predecessors at Elland Road. 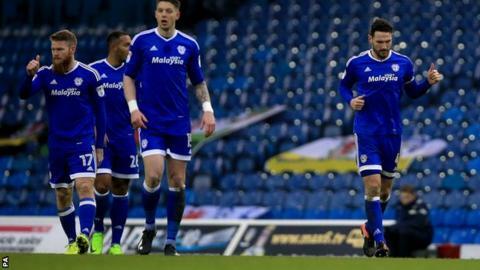 Warnock was to be the happier of the two managers as his side contained the hosts to keep only a second clean sheet of the season and then struck themselves, with Noone influential. Captain Bridcutt's dismissal was a further disappointment for Monk, whose side lost back-to-back games for the first time since September. Leeds United boss Garry Monk: "Frustrating day and frustrating result for us. I said to the players that's something new for the group. I think it's the first time we've faced a team who have been set up to frustrate and defend very well, be hard to break down and leave no space behind them. "We had to try and be patient and move the ball and move their shape to try and create spaces. Unfortunately we made two mistakes which cost us two goals and put us out of the game. "Because of how well we've done here, I think teams will come and respect us a little bit - set up in a way Cardiff did. It's for us to face, get ready for and try and overcome." Match ends, Leeds United 0, Cardiff City 2. Second Half ends, Leeds United 0, Cardiff City 2. Attempt saved. Kemar Roofe (Leeds United) right footed shot from the centre of the box is saved in the centre of the goal. Assisted by Pablo Hernández with a through ball. Attempt blocked. Joe Ralls (Cardiff City) left footed shot from the left side of the box is blocked. Assisted by Junior Hoilett. Liam Cooper (Leeds United) is shown the yellow card for a bad foul. Substitution, Cardiff City. Junior Hoilett replaces Kadeem Harris. Second yellow card to Liam Bridcutt (Leeds United) for a bad foul. Greg Halford (Cardiff City) wins a free kick in the defensive half. Attempt missed. Liam Cooper (Leeds United) header from the centre of the box is too high. Assisted by Pablo Hernández with a cross following a corner. Corner, Leeds United. Conceded by Jazz Richards. Attempt missed. Kadeem Harris (Cardiff City) right footed shot from outside the box is high and wide to the right. Assisted by Matthew Connolly. Attempt saved. Kemar Roofe (Leeds United) right footed shot from the centre of the box is saved in the centre of the goal. Assisted by Luke Ayling. Attempt missed. Kemar Roofe (Leeds United) right footed shot from outside the box misses to the right. Assisted by Pablo Hernández. Kyle Bartley (Leeds United) wins a free kick in the defensive half. Substitution, Leeds United. Souleymane Doukara replaces Ronaldo Vieira. Foul by Matthew Connolly (Cardiff City). Attempt missed. Kyle Bartley (Leeds United) header from the centre of the box is too high. Assisted by Pablo Hernández with a cross following a corner. Corner, Leeds United. Conceded by Sol Bamba. Corner, Leeds United. Conceded by Sean Morrison. Substitution, Leeds United. Kemar Roofe replaces Alfonso. Goal! Leeds United 0, Cardiff City 2. Kenneth Zohore (Cardiff City) left footed shot from the centre of the box to the bottom right corner. Assisted by Aron Gunnarsson. Corner, Cardiff City. Conceded by Liam Cooper. Attempt blocked. Sean Morrison (Cardiff City) header from the centre of the box is blocked. Assisted by Craig Noone with a cross. Corner, Cardiff City. Conceded by Kyle Bartley. Attempt missed. Chris Wood (Leeds United) right footed shot from the right side of the box misses to the right. Assisted by Hadi Sacko. Attempt missed. Kenneth Zohore (Cardiff City) header from the centre of the box is close, but misses to the left. Assisted by Joe Ralls with a cross.